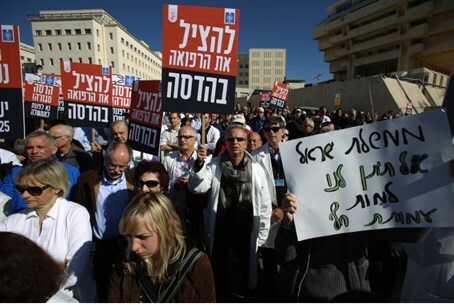 Demonstrators picket Prime Minister's Office, call on Health Minister to do something about Hadassah hospital crisis, impending collapse. Protests erupted outside the Prime Minister's Office (PMO) in Jerusalem Sunday, as the ongoing strike at Hadassah Medical Center continues to escalate. Hundreds stormed the intersection outside the office, demanding that the Finance Ministry stop the budget crisis fueling the strikes and re-open the hospital doors. "Save Hadassah Medical Center!" signs blared. "Where is [Health Minister] Yael German?" Dr. Sagit Arbel-Alon, Chairman of the medical staff for the two hospitals and a key player in the ongoing strike, took to the podium during the demonstration. "I came to ask forgiveness from the residents of Jerusalem, I came to ask from you forgiveness in the name of Health Minister Yael German, who during all of these months of crisis did not find it necessary to meet the hospital staff even once, despite our many requests," Arbel-Alon stated. "Where is the Health Minister?," she asked. "Would the Defense Minister also avoid going down to the front during wartime? You disparage us everywhere and make us out to be greedy and money-hungry." The ongoing strike at Hadassah Medical Center in Jerusalem has already driven several senior members of both Hadassah Ein Kerem and Hadassah Mount Scopus to quit, saying they were fed up over the hospital's inability to compensate for missing wages and frustrated over the tedious negotiations. The Hadassah organization released an urgent letter to the government and to the public Friday over the strike, urging the state to step up its efforts to keep the hospital going and asking for public support. The public's support has snowballed, as hundreds of medical centers across Israel went on strike in solidarity between 10 a.m. and 12 p.m. Sunday morning.